Born to the Italian nobility. Strong student, especially in scripture and theology. Priest. Eloquent writer and homilist. Pope from 440 to 461 during the time of the invasion of Attila the Hun. When Attila marched on Rome, Leo went out to meet him and pleaded for him to leave. As Leo spoke, Attila saw the vision of a man in priestly robes, carrying a bare sword, and threatening to kill the invader if he did not obey Leo; Attila left. 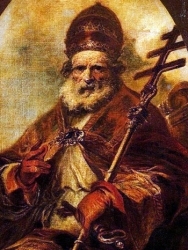 As Leo had a great devotion to Saint Peter the Apostle, it is generally believed the first pope was the visionary opponent to the Huns. When Genseric invaded Rome, Leo's sanctity and eloquence saved the city again. Called the Council of Chalcedon to condemn heresies of the day. Fought Nestorianism, Monophysitism, Manichaeism, and Pelagianism. Built churches. Wrote letters and sermons encouraging and teaching his flock, many of which survive today; it is for these writings that Leo was proclaimed a Doctor of the Church in 1574. Studied humanities and philosophy at Venice, Italy. Doctor of civil and ecclesiastical law. Ordained at age 26. Lawyer at the ecclesiastical court at Naples, Italy. During a heated courtroom argument on behalf of a friend, he supported his position with a lie; in that setting, he had committed perjury. It shook him so badly, he gave up the legal profession, and settled into a life of penance. Commissioned by his archbishop to reform the convent of Sant' Arcangelo at Naples, a house of such lax discipline it had became a topic of gossip in the city. Through good example, constant work, and the backing of his bishop Lorenzo managed to restore celibate discipline to the house, but was nearly killed for his efforts when he was attacked by people who had been ordered off the premises. The night of the attack, he was taken to the house of the Theatine Clerks Regular. He was so impressed with them that he joined the Theatines at age 35, taking the name Andrew in reference to the crucified Apostle. Master of novices for ten years. Superior of the Order. Founded Theatine houses in Milan, Italy and Piacenza, Italy and helped establish others. Eloquent preacher, and popular missioner and spiritual director, bringing many back to the Church. Writer and extensive correspondent. Friend and advisor of Saint Charles Borromeo. Suffered a stroke while celebrating Mass, and died soon after. Legend says that his blood bubbled and liquified after death, which led some to think that his stroke had left him catatonic, and that he was buried alive; a papal investigator found no credibility to any of this. Born to the nobility. Gave away all his wealth to the poor, and lived as a hermit in a hut on the banks of the River Tanaro. Miracle worker with the gifts of clairvoyance and prophesy; wild animals were reported to come to his hut to hear him speak about God. Tradition says that in 1174 he appeared on the walls of the city of Alessandria, putting a beseiging army to flight. Legends grew up around him, many of which turned him into a bishop or archbishop instead of the simple hermit he was. Benedictine monk. Priest. Missionary to the Anglo-Saxons in 601, sent by Pope Saint Gregory the Great. Worked with Saint Augustine of Canterbury, Saint Paulinus of York, and Saint Lawrence of Canterbury. First bishop of Rochester, England in 604. In 616, the death of King Saint Ethelbert of Kent led to a resurgence of paganism; Justus and Saint Mellitus of Canterbury retreated to Gaul, but in 617 returned and resumed their work. Archbishop of Canterbury in 624. Son of Breece (Bricc) of the Hy Neill, the boy grew up working on his father's farm. When his father died, Aedh's brother refused to give him his rightful inheritance. Aedh planned to kidnap a girl from his brother's household to force the issue, but Illathan, bishop of Rathlihen, Offay, talked him out of it. Aedh stayed with the bishop to study and start a new life. He founded a monastery at Cill-áir in Westmreath. Bishop. Founded churches throughout Meath. Reputed to have miraculously cured Saint Brigid of Ireland of a headache which to a tradition of his intervention for that problem. Orphaned as a child, Theoctiste was raised in a convent. Kidnapped by Arab raiders and forced into slavery on Paros island. She escaped and lived for for over 30 years as a hermitess in an old church. She was discovered one day by a hunter named Simon; she begged him to bring her Communion when he could. He returned a year later, she made her first Communion in decades, and died soon after. Sixth century king in northern Britain. Driven into Wales by the Picts, he surrended authority and became a monk. Spiritual student of Saint Seiriol and Saint Meirion at Anglesey, Wales. Poet, some of whose works have survived to today. Convert. Knew and were mentioned by Saint Paul the Apostle in the Letter to the Romans. Tradition associates her with Saint Thecla of Iconium. Missionary in Ireland, assigned by Saint Patrick to build a church at Achadh Fionnabhrach; king Duach Gallach gave Grellan land for the church after Grellan brought back to life by baptism Duach Gallach's stillborn son, Eoghan Sriabh. Missionary to Germany. Bishop of Ratzenburg, Germany. Evangelized the Baltic Coast. Martyred by local pagans. Christian physician martyred in the persecutions of Diocletian. Bishop of Subagord, Persia (modern Iran). Martyred with a spiritual student named Joseph in the persecutions of Shapur II. Bishop of Ravenna, Italy. Known as a miracle worker. Benedictine monk at Saint-Calais, France. 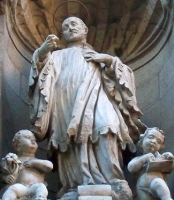 Abbot at Saint-Calais. Bishop of Sees, France for 26 years from 884. Benedictine monk at Hirschau, Germany. Elected to the bishopric of Spire, Germany, but turned it down, citing his own unworthiness. Deacon. Martyred with 22 companions. Bishop of Orleans, France. Supported monastic expansion in his diocese. Bishop. Martyred with 22 companions. Spiritual student of Saint Narses the Martyr, and martyred with him in Persia. Venerated at Melun, France, but no details of their life have survived. Bishop of Heliopolis in 471. A group of Christians who were tortured and martyred together in the persecutions of Diocletian. The only about them to survive are the names - Florentia, Modestus and Tiberius. 23 nuns, all members of the Sisters Adorers, Handmaids of Charity and of the Blessed Sacrament who were martyred together in the Spanish Civil War.